In Italy, the focus of Christmas is on family and feasting. The recipes are traditional—everyone looks forward to enjoying the dishes that their families have made for generations. The real magic happens in the way everyone—Mama, Papa, aunts, children, siblings, cousins, etc.—joins together to share in the traditions. Perhaps we’re biased, but we’ve always felt the most special part of Christmas dinner is when the cookies, Vin Santo and coffee come out. The work is all done, everyone is warm and full. What’s left but to do, but sit back, enjoy the sweetness and share stories? Virtually every Italian town has its own traditional Christmas cookie. Many of the Cookies con Amore are actually Christmas cookies that can be enjoyed year round. Here are some of our favorite holiday classics and the stories behind them. The Cuccidati is a fig-filled cookie that hails from Sicily. The star of this butter cookie is the filling: figs, dates, raisins and orange peel. It’s a traditional Christmas cookie. The ingredients change slightly from town to town. Cookies con Amore head chef Fernanda adds sweet Marsala wine to her filling, making for a classically Sicilian cookie. We bake both gluten-free and classico versions of the Cuccidati. Order a box of Cuccidati (regular or gluten-free). They are also included in our Gluten-free Christmas Cookie assortment and the Classico Italian Christmas Cookie assortment. The Ricciarelli is a traditional Tuscan cookie that is naturally gluten-free and combines orange with almond flavors. At Christmastime, you will find Ricciarelli in every bakery in Siena. Order a box of Ricciarelli cookies. They are also included in our Gluten-free Christmas Cookie assortment. One of our best loved gluten-free cookies is the Raspberry Linzer. It’s made with almond flour giving it a rich, nutty taste. We sandwich two cookies together with a tangy berry jam that complements the sweetness of the dough. The Linzer is also known as the Occhi di Bue (eye of the bull) because the top cookie in the sandwich is traditionally made with a cutout circle in the center. The jelly that is revealed looks like a large eye. For the holiday assortments, we cut the Linzer in the shape of a Christmas tree. Order a box of our naturally gluten-free Raspberry Linzer cookies. They are also included in our Gluten-free Christmas Cookie assortment and the Classico Italian Christmas Cookie assortment. 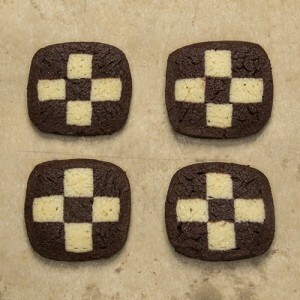 This delicate and crunchy shortbread cookie combines chocolate with orange flavors in a festive checkerboard design. No eggs are used in this buttery, rich batter. Because this cookie is labor-intensive, traditionally it is made only for special occasions such as Christmas. Order a box of Checkerboard cookies. They are also included in our Classico Italian Christmas Cookie assortment. Ginger is not a traditionally Italian flavor, but over our many years in the U.S., we developed a fondness for this traditional American Christmas cookie. When you bite into one of our Ginger Cookies you will find a soft, chewy texture. 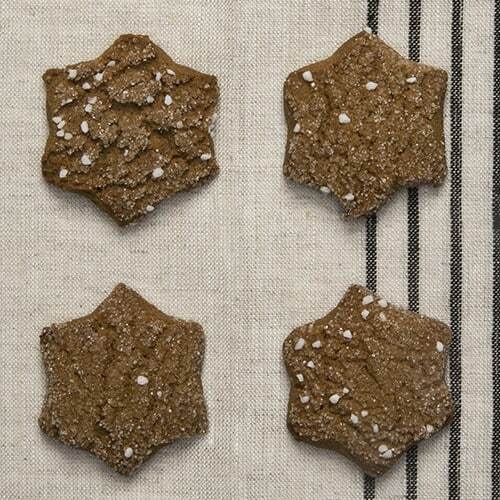 We combine molasses with ground cinnamon, ground ginger, and cloves to give these cookies a spicy flavor that will bring you back to Christmas morning. It’s included in our classico Christmas cookie assortment. Order a box of Ginger cookies. They are also included in our Classico Italian Christmas Cookie assortment. Pizzelle are very traditional thin, crisp waffle cookies that can be enjoyed on their own or sandwiched together with cannoli cream, hazelnut-chocolate spread or other decadent fillings. The name for these cookies comes from the Italian word “pizze” for round and flat. In the old days every wealthy family in Italy had its own Pizzelle iron which would press a waffle-like design featuring their family crest onto the cookies. 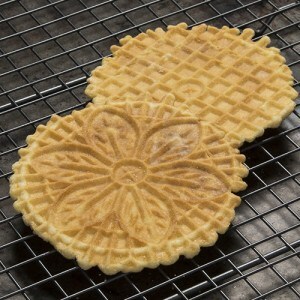 We make our Pizzelle cookies the old fashioned way, entirely by hand with traditional irons. Order a box of Pizzelle cookies for Christmas. Crostoli, or little crusts, are rectangular paper-thin pastries fried in palm oil then dusted with confectioner’s sugar to form light, delicately crisp treats that are not overly sweet. In Italy, every town has its own special name for them: Crostoli (little crusts), Cenci (rags), Nastri (ribbons), Bugie (lies), and Chiacchere (the sounds of patter or gossip) to name a few. This is one of our family’s trademark Christmas cookies. Long before we started Cookies con Amore, we would spend the entire holiday season baking batch after batch of crostoli for our friends and family. In some ways it’s what inspired us to start the company. You can serve Crostoli with ice cream (hazelnut is particularly good), but our family tradition is to serve crostoli alongside a generous bowl of ricotta spread. This Italian take on chips and dip gives you bites of cannoli without the mess. Because the recipe is not too sweet, it can be served as either an appetizer or dessert. It’s easy to make and can be prepared ahead of time. Don’t expect to have any leftovers. Mangia! Order a box of Crostoli. Whip ricotta, powdered sugar, vanilla and almond extract with an electric mixer until smooth and light. Fold in chocolate chips and the lemon and orange zest. Refrigerate. Remove when ready to be served. The Raspberry Linzer is so delicious. It doesn’t taste like a gluten free cookie at all. I am so glad I discovered your cookies. Can’t wait to introduce them to my gluten free friends and family. Just bought the Wedding Cookie this week. I’ve been GF for 36 years . This cookie is out of this world . Sooo good and great with a cup of tea. I’m so glad I found you.